25/02/08 — Vandalism — Paris, Hector Guimard – The Castel Henriette, the hôtel Nozal, the Villa la Surprise, the entrance to the Bastille metro station and many others : these works by Hector Guimard constitute a sorrowful litany of destroyed structures. Today, his buildings are listed into the Monuments Historiques. But the protection which it entails concerns only the “façades and roofs”, as if Art Nouveau were not a total art form in which the slightest detail is conceived and designed by the architect. Alas, in 2008 it is still possible to take buildings apart piece by piece even if they are among the most important examples of French art, and without incurring any legal action. The profits from these sales are often negligible as their only value lies in their presence in situ. 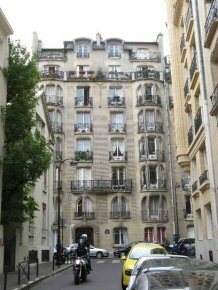 Currently on Ebay there is a sale of two doors by Guimard (a double one and a single), still in their original home, most probably an apartment located in one of the group of buildings on the rue Agar (ill.). Under the circumstances, there is only one thing to do to respond to such vandalism : file an immediate application to list the building as a monument, thus gaining time to do some serious thinking about the best way of protecting the interiors (perhaps by proposing a measure specifically adapted to this type of buildings, such as forbidding the removal of original elements). Unless action is taken soon, Art Nouveau architecture will only consist of an empty shell.